Alcatel today announced its 3 Series smartphones, part of its larger family of new Android handsets. The 3 Series encompasses three phones that will offer screens measuring 5.5 inches (3), 5.7 inches (3X), and 6 inches (3V). All three screens adopt the 18:9 aspect ratio. While the 3 and 3x use HD+ (1,440 by 720) resolution, the 3V jumps to full HD+ (2,160 by 1,080) resolution. All three phones share a number of features, such as 2.5D curved front glass, curved rear panels, dual cameras, and fingerprint sensors. Each includes Bluetooth, WiFi, GPS, microUSB, memory card support, and LTE 4G. The 3 series phones share the same 5-megapixel selfie camera with LED flash, and each packs a 3,000mAh battery. 3V: The largest of the three phones (pictured) includes a quad-core MediaTek processor clocked at 1.45 GHz with 2 GB of RAM and 16 or 32 GB of storage. The rear camera has a 12-megapixel main sensor and 2-megapixel secondary sensor for bokeh-style photos. Other camera features include HDR, panorama, EIS, filters, and video stabilization. It comes in black, gold, or blue, and runs Android 8 Oreo. 3X: The mid-sized member of this pack has a quad-core MediaTek processor clocked at 1.28 GHz and it ships with with 2 or 3 GB of RAM and either 16 or 32 GB of storage, depending on the variant. Its dual-camera setup includes a 13-megapixel main sensor with HDR, two-tone LED flash, and EIS, accompanied by a 5-megapixel secondary sensor with wide-angle shooting. It comes in blue, black, or gold, and runs Android 7 Nougat. 3: The smallest of the three phones has a quad-core MediaTek processor clocked at 1.28 GHz and it ships with with 2 GB of RAM and 16 GB of storage. The camera boasts a 13-megapixel sensor with EIS and HDR. 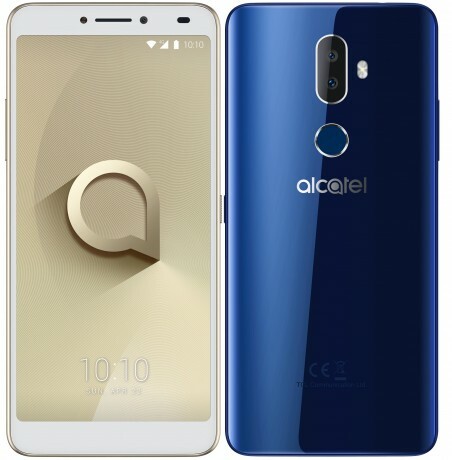 The Alcatel 3 runs Android 8 Oreo and comes in blue, black, or gold. TCL said the 3 Series handsets will go on sale in select markets starting in April. Pricing ranges from about $150 to about $225, depending on the configuration. The company didn't specify if or when these phones might be sold in the U.S.
TCL Communication today announced three new devices falling under the Alcatel brand. These phones are the first in a range of affordable devices that target different price points. Samsung today announced the Galaxy S8 and S8+, its flagship smartphones for 2017. The phones marry aluminum frames to curved glass panels as they adopt what Samsung calls its Infinity Display.